dbnAudile were commissioned to produce several shows for adidas in London’s Village Underground. During the summer of 2012, dbnAudile were commissioned by creative event agency Sparklestreet Projects to produce a series of cutting-edge multimedia shows for adidas in London’s Village Underground, to tie in with the Olympics. The highlight of the series was a secret performance by the Stone Roses, a once-in-a-lifetime opportunity for the invited audience of Olympians, celebrities, and fans to see this legendary band at the height of their powers, in an intimate five-hundred-capacity venue. Other shows included a screening of the Chemical Brothers’ film ‘Don’t Stop’ in full concert-level 7.1 surround sound, and a unique surround-sound DJ set by Francois Kevorkian. With the aim of the event being to push the boundaries of multimedia technology to create the ultimate experiential event, and each night having unique and highly specific technical requirements, the series demanded versatile production hardware. With the layout and orientation of the venue changing between nights to complicate matters, a flexible and creative approach was required to system design, rigging and operation. dbnAudile provided a d&b audiotechnik sound system, re-configured on a daily basis depending on the particular needs of the day’s event. For most shows the system was flown as a 7.1 surround system with V-series main and sub-bass arrays, and Q-series surround and centre speakers. 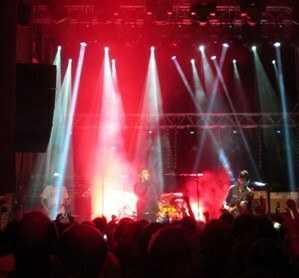 For the Stone Roses and other live band shows, enlarged V-series arrays were flown in a stereo configuration. For FK’s surround-sound night, five V-series arrays were ground-stacked and time-aligned to his exacting specifications, to ensure the ultimate immersive listening experience.